Overlooking the Gulf of St Tropez, in the department of Var, lies the picturesque town of Sainte Maxime. With the clear waters of the Mediterranean to the south, and the shelter of the Maures Mountains to the north, this town boasts breathtaking views. The weather too is exceptional, with over 300 days of sun annually, and it is this combination that has drawn artists, writers and poets to the town for generations. 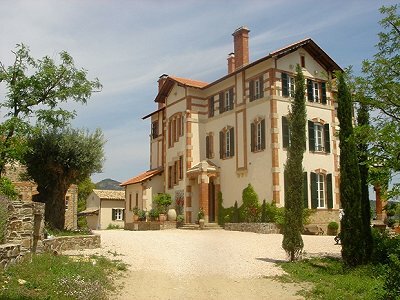 No wonder this is a popular and lucrative area to buy a Sainte Maxime villa for sale. Originally named after a monk living in the 8th century, the town was, for centuries, little more than a collection of farmsteads centred around the church. It was only in the 18th century that the town began to grow into the vibrant and beautiful town that exists today, due to the fertile plains that surround the town and the ever growing port. With the creation of the Frejus-Cogolin railroad, visitors began to discover this picturesque port, and ever since it has drawn many famous names, such as Matisse and Jean de Brunhoff, creator of ‘Barbar the Elephant’. In fact, having set some of his work in the town, the local beach is now called ‘Elephant Beach’. 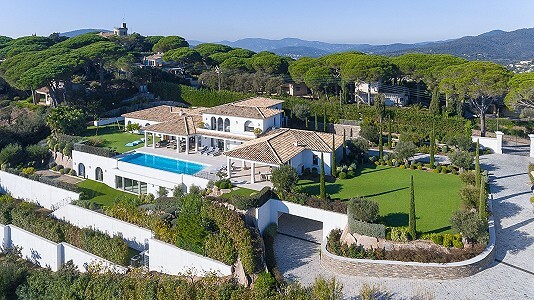 There are a wealth of new and resale houses, apartments and villas for sale in and around Sainte Maxime, with prices ranging from just 100,000 to over 8 million euros – we have a large selection of villas for sale. By purchasing a Sainte Maxime villa either as a second home or purely as an investment, you can be sure you have chosen one of the more interesting and vibrant areas of the French Mediterranean coast. Despite being a tourist destination, Sainte Maxime still retains its traditions and history. The locals still celebrate the coming of spring on the first of May with the festival of ‘The Little Girl of May’. At the end of November the olive harvest, which produces the regions famed olive oil, is celebrated, showing the locals have not forgotten their farming traditions. Of course, the monk that gave Sainte Maxime its name is also celebrated. Also in May, locals gather for the annual feast and procession to the church to commemorate the date of the monk’s death. View our portfolio of coastal and urban Sainte Maxime villas for sale. We also have many apartments, including studio, duplex and penthouse. In the old town, not only have the ancient traditions not been lost, but neither has the architecture. Here the pedestrianised streets lined with shops and cafes have a feel of authentic French history about them, perfect for whiling away a day in the sunshine. From here, the square tower ‘La Tour Carree’ can still be seen. There are over 10km of clean sandy beaches in and around Sainte Maxime. As well as ‘Elephant Beach’, each is organised to offer something different. La Croisette Beach offers a specialist sailing school, Madrague Beach a diving school, and La Nartelle Beach offers jet and water skiing. Most of these beaches, especially in the town centre, have lifeguards on duty offering safe swimming facilities in the clear waters of the Mediterranean. The beaches in the town can also be enjoyed from the promenade, the views across the ocean being especially spectacular at sunset which can be enjoyed from one of our large selection of Sainte Maxime property for sale. As well as the abundance of water sports, Sainte Maxime has much to offer. With two sports halls and many outdoor facilities, the town can offer every sport from tennis to archery. There is also an 18-hole golf course on the outskirts of town. Other facilities include cinemas, theatres, two modern shopping centres, a casino, and even a music school, offering courses for all levels.